The container industry is facing more challenging headwinds with gloomier economic outlooks and rising protectionism adding another level of unpredictability to the market. Our Container Market Annual Review and Forecast provides the accuracy, detailed insight and industry knowledge required at such a time. 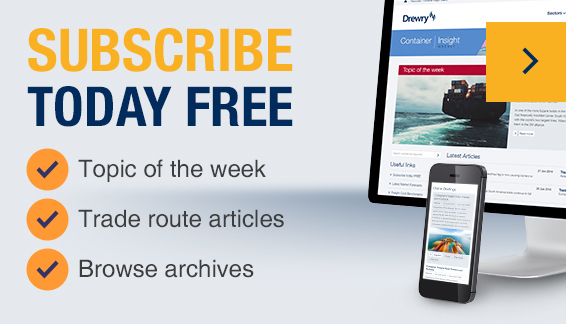 Drewry’s Container Market Review takes a look back at the developments over the last year and how they sit within the broader picture of the container market. Drewry continues to enhance the analysis provided, with relevant forecasts through to 2022. The Container Market Annual Review and Forecast 2018/19 is one of Drewry Maritime Research’s annual reports, providing a complete review of the industry whilst also presenting detailed forecasts for key metrics. This report is also available as part of the Container Forecaster set of reports. This annual review and forecast is the 3rd quarter edition of the Container Forecaster annual subscription - released on a quarterly basis.